This 100% wool mitten will be sure to keep you warm and toasty this winter. Did you know that all (that's right ALL) of Upper Michigan has the area code of 906? Isn't that amazing? We like to say it's God's area code! These mittens are 100% wool with black palms and they are lined with high quality winter fleece like all of our mittens. They even come with a tiny diamond and instructions on how to apply it to your favorite spot in Upper Michigan. 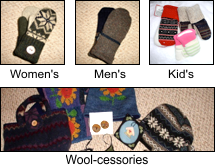 Did you know that upNorth Mittens are located in over 20 retail shops across Michigan, Wisconsin, Illinois, Minnesota, and Alaska? Ordering a pair of upNorth Mittens is akin to ordering snowflakes. No two are alike! Learn how our special recycling process makes this possible!